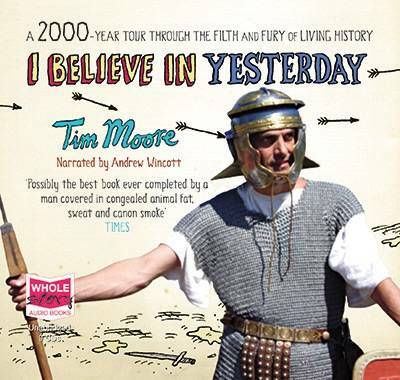 "I Believe in Yesterday" is an odyssey through 2,000 years of filth and fury, where men were men, the nights were black, the world was your outside toilet and everything tasted faintly of leeks. In 1989, Tim Moore moved into the last house in Chiswick with an outside toilet. Intrigued by a subsequent encounter with an elderly former resident, and shamed to confess the phobic haste with which he demolished this facility, he finds himself inspired to travel back to the land before now, experiencing the horny-handed hardships and homespun pleasures enjoyed and endured by Moores gone by. The journey that follows takes him through the world of historical re-enactment, sitting at the bare and grubby feet of retromaniacs who have seen their future in the past, and learning their singular ways. Living on bramble leaves, Johnny cake and porridge, Moore travels from the Iron Age to the Steam Age, sharing straw beds and daft hats with period obsessives driven by socio-historical curiosity, disillusionment with the pampered fecklessness of the modern world, or a simple nostalgia for campfires, flatulence and brutality. Along the way, he meets living historians for whom authenticity means pulling their own teeth out and dyeing outfits in urine, and those who stride back through time with a Nokia and a packet of fags stuffed down their codpiece. This recording is unabridged. Typically abridged audiobooks are not more than 60 per cent of the author's work and as low as 30 per cent with characters and plotlines removed.